The Food and Drug Administration (FDA) recently proposed two new sets of regulations as part of the government effort to combat bioterrorism. Both regulations implement requirements found in the bioterrorism legislation of 2002. Virtually every food manufacturer operating in the U.S. will need to become familiar with these regulations and take steps to comply. The proposals will most likely be finalized in the middle of 2003, and compliance will be required by December 2003. Every facility that manufactures, processes, packages or holds food for consumption in the U.S. will need to register with FDA. The registration process will involve submission of a Food Facility Registration Form designed by FDA. In most cases, the form will be completed and submitted over the Internet, but FDA will also provide for registration by mail. In any case, FDA will assign a registration number to the facility when registration is complete. The proposed registration form calls for information such as the name and location of the facility, emergency contact information, the types of operations performed at the facility, and the types of food handled. Foreign facilities will need to identify a U.S. agent. It appears that the time and resources required to complete and submit the form will be minimal. Learning the regulations will be more burdensome, but those who fail to do so will face the consequences of non-compliance. A domestic facility must register if it manufactures, processes, packages or stores "food." A foreign facility must register if it is engaged in one or more of these activities with a food that is to be sent directly to the U.S., with no further processing before it arrives there. A three-step analysis essentially determines whether a given facility needs to register. First, is the facility, in fact, handling "food?." Second, is it conducting a manufacturing, processing, packaging or storage activity? And finally, does the facility qualify for an exemption? Most often, farms, restaurants, retail establishments and fishing vessels will qualify. Additionally, facilities that only handle food regulated exclusively by USDA (meat, poultry, eggs) will be exempt from registration. "Food" includes items that we all readily recognize as such, as well as other items. For example, food additives and raw ingredients qualify as "food" in this case, as do animal feed, live food animals, and substances that migrate to food from packaging materials or other food-contact articles. FDA will undoubtedly receive comments regarding this expansive definition of food (taken from the Federal Food, Drug, and Cosmetic Act). For purposes of facility registration, the Bioterrorism Act refers to "food for consumption. Arguably, Congress did not intend this phrase to encompass items as far removed from consumption as packaging materials and live animals (while exempting meat, poultry, and eggs). Furthermore, some clarification might be needed regarding migrating species from food packaging materials. Do they become "food" only after the migration into food has taken place? Does de minimis migration count? What if the extent of migration depends upon the intended use of the packaging material? What FDA will do with this information? The FDA proposal does not go into great detail about how the facility registration information will be handled and used within the Agency. Nor does it need to: The Agency's proposed rule fulfills a congressional mandate. As expected, the proposal does state that the information will be used in the event of a threatened or actual bioterrorist attack, or in case of a food-related public health emergency. In other words, the registrations will form a database for FDA to use during a crisis, though the agency is likely to find the database useful for other purposes. For example, it may serve as a roster of candidates for FDA inspection, and may help track or contain an outbreak of food-borne illness not associated with terrorism. In general, FDA will not disclose facility registration information to the public. The Bioterrorism Act states that registration information is not subject to disclosure under the Freedom of Information Act. FDA notes, however, that this nondisclosure policy does not apply to information FDA obtains by means other than registration, or information previously disclosed to the public. The second recent proposal will require purchasers, importers or agents to notify FDA before a shipment of imported food reaches the U.S. The notification must be submitted by noon (noon at the responsible FDA field office) of the calendar day before the day of arrival. This regulation will be significantly more burdensome than the facility registration requirement because it will require ongoing compliance. With few exceptions, a notification will be required whenever "food" is being brought across the U.S. border. The exceptions cover (1) food brought into the U.S. by travelers for their own consumption; and (2) meat, poultry, and eggs that are subject to USDA's exclusive jurisdiction. Once again, FDA proposes an expansive definition of "food" that includes such items as animal feed, food additives, substances that migrate into food from food packaging materials, and live food animals that enter the U.S. FDA asserts that the definition of "food" in the Federal Food, Drug, and Cosmetic Act is operative here. It may be argued, however, that Congress did not intend such a broad definition of "food" to apply to import notification. The Bioterrorism Act uses the phrase "article of food" in this context. The amount of information that must be provided in a prior notice is extensive. It includes the identity of each article of food being imported , by FDA product code, common or usual name, trade name, quantity, and lot codes, if available. The foreign manufacturer of the food must also be identified, along with the registration number assigned to the facility at which the food was manufactured, if applicable. The notification must also indicate the anticipated port of entry along with the anticipated date and time of entry. This is not a complete list of the information requested in the prior notification, but it's enough to give you an idea of how much effort the notifications will require. For some types of cargo, such as bulk shipments of rice or cocoa beans arriving by ship, the burden associated with prior notification may not be great. However, prior notification for a truck carrying a variety of perishable produce from Mexico or Canada will be a more complex undertaking. A shipment will be refused entry for failure to submit an adequate and timely prior notification. In accordance with the Bioterrorism Act the shipment will then be held at the port of entry until a "prior notice" is submitted to FDA, and FDA is able to examine the prior notice and deem it adequate. In some cases, FDA may require that a shipment detained for lack of prior notification be removed to a secure facility pending release. FDA is accepting written or electronic comments on both proposals through April 4, 2003. 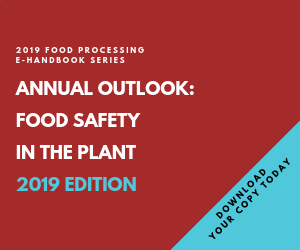 Food manufacturers and importers affected by these rules are strongly advised to study the proposals (and not rely on this summary) and gear up for compliance in December 2003. Parties submitting comments should recognize which aspects of FDA's proposals are mandated by the Bioterrorism Act and not really up for discussion. David Joy is a partner at the Washington D.C. law firm of Keller and Heckman LLP. He specializes in food and drug law with emphasis on the domestic and international regulation of food, food additives, food labeling, antimicrobial pesticides, and medical devices. He is a member of the District of Columbia Bar and holds a bachelor's degree in chemistry. For more information about Keller and Heckman, visit the firm's web site at www.khlaw.com.